The large size Boba Fett was the last 12" figure to be made available for sale at retail from the large size action figure line in Canada (IG-88 was never available in Canada in Canadian packaging). While Boba Fett was a big seller upon its release in the Fall of 1979, the figure was initially advertised in retail catalogues with many "additional" features that excited many Canadian children. As can be seen below, the original Irwin Toys (Kenner Canada) Trade Catalogue of 1979, used to promote upcoming toy lines to prospective retailers in Canada, contained a prototype image of the 12" electronic Boba Fett that had a textual description that sported many exciting features including 3 safe "spring-fired" rockets, (battery operated) LED lights in chest plate, removable arm flame thrower, removable dart weapon and electronic sound. Interestingly enough, the "LED lights in chestplate" has been crossed out in pencil on this page from the Irwin Trade Catalogue (shown below); most likely by an Irwin representative that had been updated on the actual features of the production version of the figure. Odd that the other non-existent features weren't also crossed out. The description also says Ages 4 and Up, but the production figure's box actually has Ages 5 and Up printed on it. Since there is often very little lead time between when a product is made available for sale late in the year and the cutoff date for product inclusion in a retailer's Christmas catalogue, companies will often use the descriptions found in promotional materials (often for unfinished products), such as the Irwin Trade Catalogue, for their catalogue descriptions. As can be seen in the two catalogue descriptions shown further below, the features described in the Irwin Trade Catalogue actually found their way into several companies' retail catalogues. This, of course, caused a great deal of excitement late in 1979 in Canada, especially with the announcement of the rocket firing feature. Don't forget, it was not so many months previous to the announcement of the 12" figure in 1979 that the special mailaway offer appeared on Canadian 20-backs for the 3 3/4 inch Boba Fett action figure that was to have the rocket firing feature with it. This feature, of course, was changed to a rocket that was sonic welded inside Boba Fett's backpack with the spring firing mechanism removed for safety reasons. So, the anouncement of the rocket firing feature on the 12" version of Boba Fett in some Canadian retail catalogues caused quite a stir in schoolyards across Canada in the Fall of 1979. 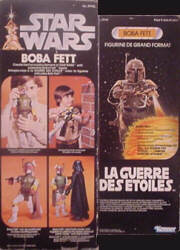 Shown below are two examples of the photographs and accompanying text that were included in two different retailer catalogues in 1979 that showcased the 12" Boba Fett figure. What is most noticeable about the prototype Boba Fett used in this catalogue photo are the absence of the rangefinder backstop (and the rangefinder in general) and the inclusion of the LED display on Boba Fett's chestplate. As can be seen in the closeup photo above, the rangefinder does not have the regular backstop that sticks out perpendicular to the production figure's head. Also, the original prototype LED display can be clearly seen on Boba Fett's chestplate, and lit up as well. The LED indicator was changed to a "lensatic" life support indicator on the production figure, which was really just a small flicker card. Although it is very difficult to see in the catalogue photo, the spring-firing mechanism that would have been used in the wrist dart is also part of this particular figure's makeup. The dart itself is absent from Boba Fett's wrist, and the hole is present in the orange coloured wrist appendage where the dart would have been placed. The red & white rockets in the backpack are also missing. The backpack actually had 2 rockets - one in the middle firing stem (which was replaced by the grappling hook on the production version), and another extra rocket located to the left of the middle stem. 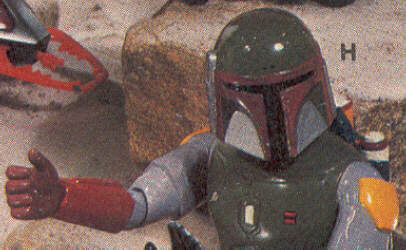 It is difficult to make out in the catalogue photo, but parts of the Boba Fett figure are hand painted. As can be seen in the catalogue photo above left, some of the features from the Irwin Trade Catalogue were included in the product's description in the retail catalogue. The 3 rockets that the catalogue description refers to are the 2 in the backpack and the third in the wrist dart thrower. Shown here is a second catalogue photo from 1979. Although the text description from the catalogue is very short and to the point, it still mentions that the figure comes with LED lights in the chestplate. The LED can be seen as it is positioned in the middle of Boba Fett's left chestplate (on the right from this point of view), as opposed to its placement closer to the middle of the chestplate on the production figure. The 3 rockets are not present in this photo either, but the middle rocket's stem mechanism can be seen jutting out of Boba Fett's backpack. The backstop on the rangefinder is also absent here. 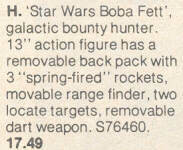 The catalogue description of Boba Fett's (absent) feature can be seen above right. 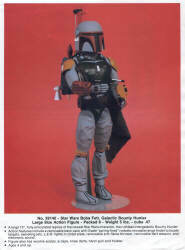 When the 12" version of Boba Fett was finally released in Canada, it did not come with the previously described features. What was actually released was a pared down and more cost effective version of the original prototype that was generally released everywhere around the world, but Canadian children didn't seem to mind. As with the other Canadian versions of the 12" figures, the Boba Fett is extremely difficult to find in Canadian packaging. Oddly enough, reports from UK collectors have also indicated that the Canadian version of the large size Boba Fett was also sold in Great Britain. More information regarding this 12" electronic, rocket firing Boba Fett can be found here and here on the Star Wars Collectors Archive. On a more humourous note, one of the French translations on the Canadian box sports an error of sorts. 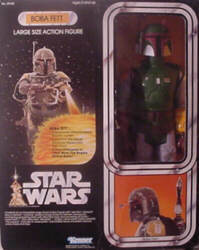 On the reverse of the box, the fearsome bounty hunter is named "BOB" Fett in one area, as can be seen below.